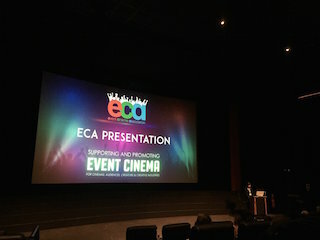 The Event Cinema Association’s fifth annual conference took place in London Wednesday at the Vue West End in Leicester Square. As part of a busy day’s presentations, discussion and networking the ECA Box Office Awards were the highlight of the day. Sponsored by Encompass for the second year running, the awards are intended to give recognition to the effort and achievements of the ECA’s very global membership, and the winners demonstrate the vast diversity and appeal of Event Cinema in all its different genres. The winners this year demonstrate the true international nature of the Event Cinema industry, with medals going to distributors Exhibition on Screen and the Royal Opera House in the UK, Nexo from Italy, Pathé Live from France, Piece of Magic Entertainment from the Netherlands, a multitude of gongs to Fathom Events in the USA including the only gold medal for last year’s smash hit Pokémon The Movie – I Choose You! and, closer to home one of two awards going to newcomers Trafalgar Releasing for Dave Gilmour Live in Pompeii, a music concert attended by nearly 400,000 fans in cinemas worldwide, which gained them a silver award. Normally the Awards for Excellence recognizing the best exhibitors and outstanding contribution categories would take place at the same time but these are planned to take place at the next Slate Day later in 2018. The focus this time was on Box Office excellence at this event. The ECA Conference was kindly supported by Gofilex, Éclair, CinemaNext, Motion Picture Solutions, Vue, Cineplace, Demand.Film, Magnutido, Managed Networks, Qubewire, NEP Broadcast Solutions, Fathom Events, More2Screen, Strike Media, Coca Cola, Molson Coors, We are Pops and Speakeasy Ice Cream. It was attended by 200 industry professionals from the UK, North America, Australia, Europe and the Middle East. · Fathom Events - Pokémon The Movie – I Choose You!